JOINT BASE PEARL HARBOR-HICKAM, Hawaii (AP) — President Donald Trump paid a solemn visit to the memorial at Pearl Harbor, a sacred journey for a commander-in-chief about to depart on an Asia trip that will be shadowed by fears of another international conflict. 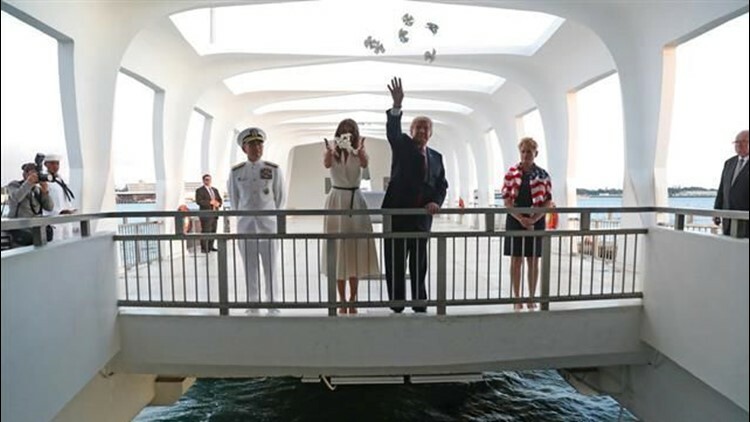 Trump saluted Friday after entering the USS Arizona memorial following a short boat ride with first lady Melania Trump. They approached a wreath of white flowers — a gift from the couple — and watched as two sailors who stood beside it at attention placed the wreath near a wall of names of the fallen. The Trumps then tossed white flower petals into the waters above the battleship's sunken hull, as the president then peered down where the rusted wreckage is visible at the water's surface. Nearly 1,200 crew members died on the USS Arizona during the December 7, 1941 surprise attack by Japan that plunged the U.S. into World War II. Trump, who had spoken earlier in the day about being eager to see the sacred site for the first time, appeared moved by the visit. As the wreath was quietly placed into position, Trump crossed his arms in front of him, closing his eyes as he bowed his head in remembrance. As the sun began to fade over the Pacific, Trump then listened intently to a National Park Service tour guide, stopping briefly at a display that explained how some survivors of the attack, when they die years later, have chosen to be cremated and have their ashes placed in the sunken ship alongside the remains of their fallen colleagues. Trump said not a word about North Korea or its nuclear ambitions on Friday, the eve of his first official visit to Asia. He will arrive in Japan on Sunday morning, the first of five countries he will visit over 11 days as he exhorts Asian allies to increase pressure on Pyongyang to abandon its deadly ambitions. Hawaii acted as a sort of midway point on Trump's trip halfway around the world. He arrived at Joint Base Pearl Harbor-Hickam Friday after a daylong flight from Washington. Trump wasn't the only attraction to arrive on base. A few in the crowd shouted their admiration for White House chief of staff John Kelly. "We love you Gen. Kelly," one person shouted at the retired four-star Marine general who stood several feet behind the president. "We are going to visit very shortly, Pearl Harbor, which I've read about, spoken about, heard about, studied, but I haven't seen. And that is going to be very exciting for me," Trump said at the start of a briefing with leaders of the U.S. Pacific Command, which oversees U.S. military operations in the region. The USS Arizona Memorial at Pearl Harbor marks the final resting place of more than 1,000 sailors and Marines who were killed on the battleship during the surprise attack on what President Franklin Roosevelt deemed "a date which we live in infamy." Accessible only by boat, the memorial straddles the ship's sunken hull. The visit to the memorial comes soon after Trump was embroiled in a controversy over his attempt to console the grieving families of America's war dead. The family of one of the four soldiers killed in a Niger ambush last month said the president disrespected them when he called to offer a condolences, a charge Trump vehemently denied. And The Associated Press discovered that a number of families of soldiers killed since Trump took office had not received a call from the president, despite his claim that he had called nearly all of them.